Okay, you’ve probably heard it…..”you will be tendering at this port”. So, what exactly does that mean? It’s actually quite simple. A tender is basically a water taxi that will pick you up at the ship and then drop you off at the port of call. Some of the reasons that you would need to use a tender instead of having the ship just dock at the pier are that either the area around the port is not deep enough for a ship to sail into or there are protected coral formations near the shore, there are too many ships in port that day, your ship is too large for the port, or else the selected port town doesn’t have the facilities that enable the ship to dock. Caribbean ports that require tendering are Belize; Cabo San Lucas; Grand Cayman; Half Moon Cay, Bahamas; and Princess Cays, Bahamas. Check out my YouTube video showing what it’s like to tender here. How does tendering work? The ship will anchor in deep waters a distance from the port, but usually in sight of the port. A number of tenders will then approach the ship from the port. The cruise line will usually hire local tender boats to tender their passengers. However, some ships use their lifeboats as tenders. There is usually one tender docked to the ship, and one waiting to dock. One at a time the tenders will moor themselves to the ship at the gangway, where a small portable floating dock is attached, and then you will be allowed to board them from outside the gangway door. Usually those with shore excursions are allowed to take the tender first, they will be issued numbers, and then everyone else can leave. Your cruise ship will inform you of the process. If you’re not going on an early shore excursion it’s usually easier to just get a leisurely breakfast and wait for the rush of those wanting to exit the ship to be over. After that you can get on a tender quickly and easily. Don’t forget your sea card, you will need it to disembark and re-embark. You can go to shore at any time during the time you’re in port, but be sure that you leave enough time to explore and then get back to the ship because getting a tender back to the ship takes a while. Tendering is by no means a quick process. Once the tender is filled, it will then transport you from the ship to the port dock. It may be approximately a ten to twenty minute ride, sometimes more, depending on the distance the ship has to anchor from the port. I’ve never gotten seasick on a tender, but they do roll side to side more than the ship does, so if you are prone to motion sickness, you may want to take something for it before you get on the tender. A tender boat will usually have multiple layers of seats, some in the shade, and sometimes more seats on top in the sun. They also carry enough life jackets for everyone. Be especially careful getting on and off tender boats. Because of the nature of the ocean, both the ship and tender will be moving slightly in good weather, and more if the waves are high. Hold the handrails and your children’s hands and allow the ship crew to assist you. 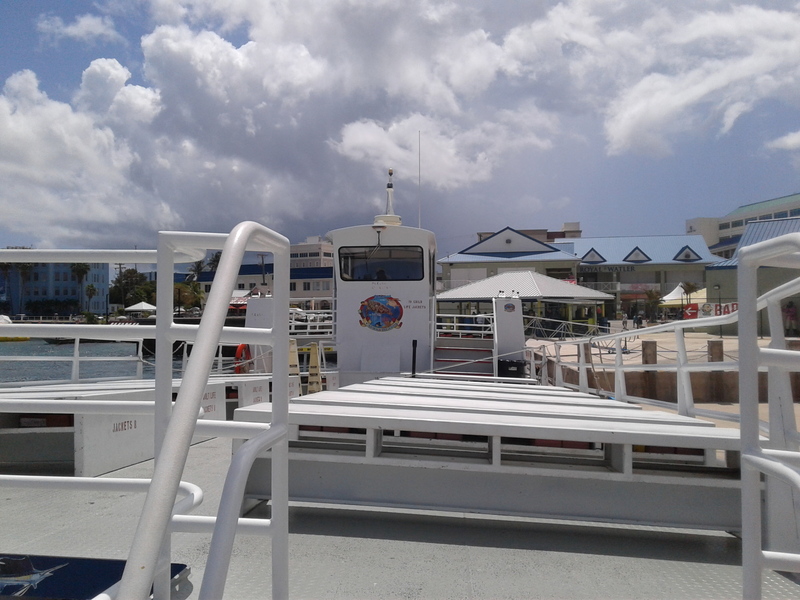 And be sure to stay seated while the boat is moving and make sure that your children are being supervised and required to stay seated. You don’t want to have any sort of injury to ruin your cruise. I’ve never had a problem with tendering, but in rough seas you never know. There is no additional cost to use a tender boat to get to shore or back to the ship, and it’s an adventure in itself. Don’t let it intimidate you. After you’re done exploring and shopping in port you will come back to the dock, and they will guide you to the correct tender line for your ship. You’ll show your ship’s sea card before you get into the line and get onto the tender, so there should be no problem getting back to the correct ship. Be aware that if you try to get back to the ship close to the time that the ship leaves the port, there may be very long lines to the tender since everyone else is trying to get back before the ship sails also. Those lines can seem even longer in the Caribbean heat, so be prepared. I find it best to get back to the ship well ahead of the time you’re supposed to embark. And don’t be late because the ship will sail without you, believe them when they tell you that. The tender will then take you back to your ship and drop you off at the gangway where you started. You will need your sea card to embark, just as you would in a regular port, so don’t forget it. 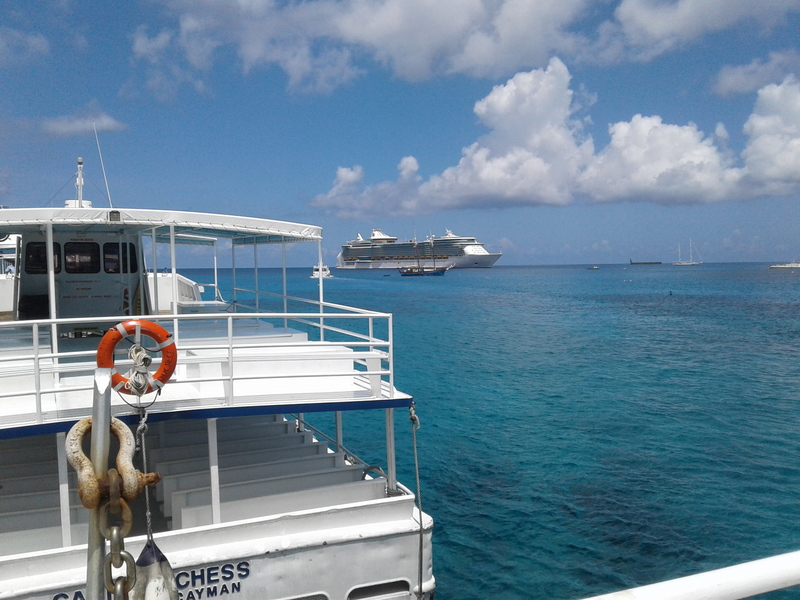 One of the great things about tendering is the great photos and videos that you can get of your cruise ship from afar. We’ve tendered at Georgetown Grand Cayman twice, and in Belize once. Not all tenders are handicapped accessible. The tenders that I’ve been on have had steps, so I’m not sure how easy it would be for a wheelchair. Contact the cruise line ahead of time to see what their policy is. According to the Royal Caribbean site, “Guests with assistive devices who are unable to take a few steps will be unable to board tenders unless roll-on capability is available. In order to safely board most tenders, guests must be able to take steps and use a collapsible manual wheelchair. In addition, motorized wheelchairs and mobility scooters cannot be taken on tenders, unless roll-on capability is available. Inquire about tender roll-on capability at Guest Relations Desk while on board. Please note roll-on capability is not guaranteed. ” According to Carnival’s website, “Safety restrictions prohibit crew from carrying individuals onto or off the tenders.” So, basically, if you are in a wheelchair or scooter and cannot walk to get onto the tender, there is no guarantee that you will be able to take a tender to port. Keep that in mind when you book your cruise and call the cruise line to see what advice they can give you and to see if there will be wheelchair accessible tenders at your port of call. This entry was posted in cruising and tagged addicted to cruising, Caribbean, cruise blog, cruise port, cruiseblog, cruising, dolphin, hsp, introvert, quietcruiser, royalcaribbean, ship, tender, tendering on June 1, 2018 by The Quiet Cruiser.